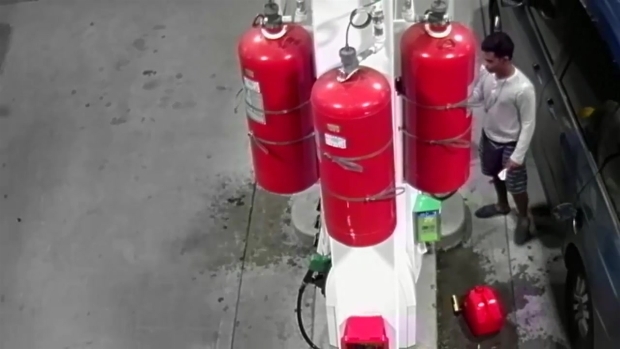 The man who was coughing up blood from a “collapsing throat” after an arsonist lit one of Staten Island’s gas stations pumps ablaze says he could’ve passed out and died as a massive fireball engulfed the station. The NYPD released shocking new video that shows the man they say put a 7-Eleven on Staten Island up in smoke. Gerard Lara spoke exclusively to NBC 4 New York on Tuesday and said he was pumping gas at the Bulls Head 7-Eleven Monday morning when he heard a pop and then saw flames. 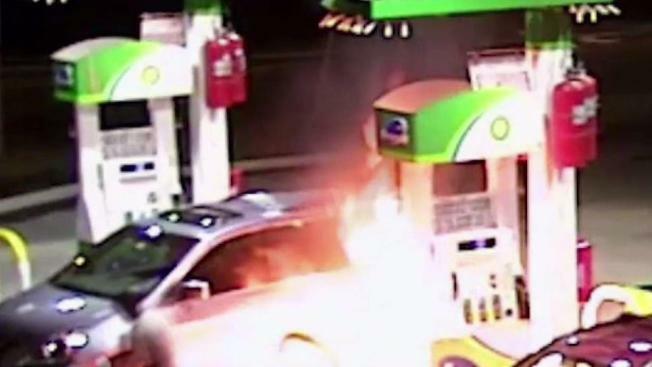 A man was caught on camera intentionally setting a gas pump on fire on Staten Island. Caught in the middle of the flare-up was a 21-year-old man just trying to fill up his car. Lori Bordonaro spoke exclusively to his brother. It was just before 2 a.m. Monday when surveillance footage from the station, on Richmond Avenue near the College of Staten Island, showed the man apparently absentmindedly filling up a canister. He is then seen glugging gas all over the base of the pumps, lighting up a piece of paper and unleashing a booming fireball. Police are looking for a man who was caught on camera spraying gas all over a Staten Island 7-Eleven, then torching the station. Kerry Barrett reports. 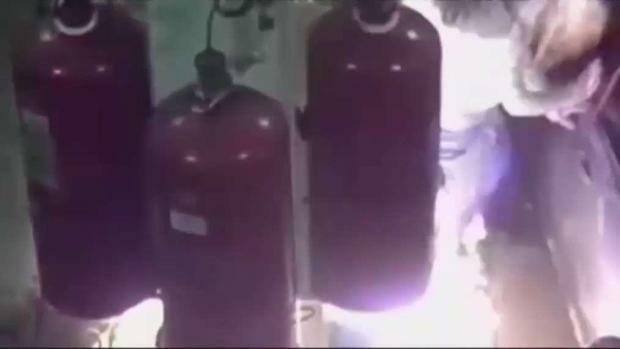 Feet away from the explosion, Lara said he was on the ground, forced to claw his way to safety. Unable to see through the thick smoke and fire-stopping foam, he makes his way to the inside of the station, where he said he collapsed, coughing up blood. 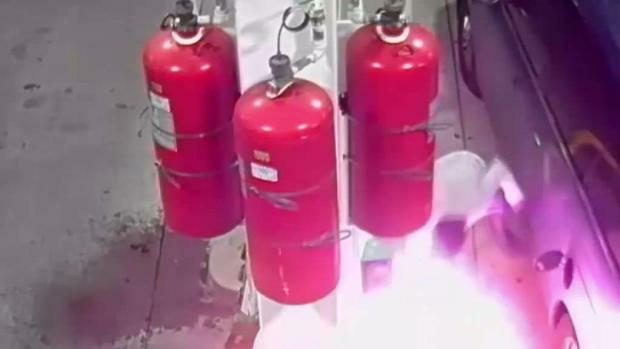 The arson suspect seen in the video takes off as the station’s extinguishers douse the flames. The man hasn’t been seen since. Police are looking for the man who torched a gas station. 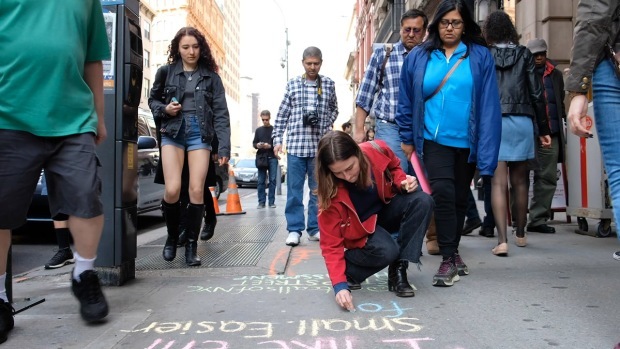 Lara says although he suffered internal bleeding and hurt lungs, it could have been much worse. Anyone with information about the arsonist should call Crime Stoppers at 1-800-577-TIPS.